Fits Daniel Boone and Jim Bowie models. Includes the oven and a specially made pizza stone for the ultimate wood-fired pizza experience. Cook ristorante quality pizzas in 2-4 minutes. 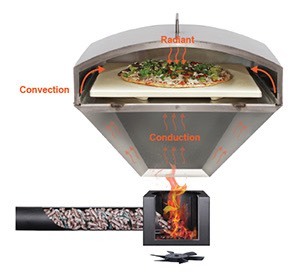 The pizza oven attachment raises the internal temperature of your pellet grill to that of a real wood burning pizza oven by funneling the heat from the fire box directly up and into the stone baking chamber. This creates temperatures upwards of 800 degrees fahrenheit allowing you to cook ristorante quality pizza in 2-4 minutes. The steel housing chamber creates a unique air flow system which enhances the convective, conductive, and radiant heat in and around the cooking chamber.